See a zoomable version of this graphic below. William & Mary continues its impressive streak in alumni giving as the No. 1 nationally ranked public university in the U.S. for undergraduate alumni participation. W&M keeps increasing alumni participation year after year, despite strong downward national trends, and just set a new university record for alumni giving - 29.9 percent of undergraduate alumni, or 19,273 alumni, gave back to their alma mater in fiscal year (FY) 2017. Alumni, parents, students, faculty, staff and friends have played a vital role in advancing the For the Bold campaign's overarching engagement and philanthropic goals, and helped the university raise nearly $135 million in FY17. This is the second largest fundraising year ever, and the fifth consecutive year in which William & Mary has raised more than $100 million. 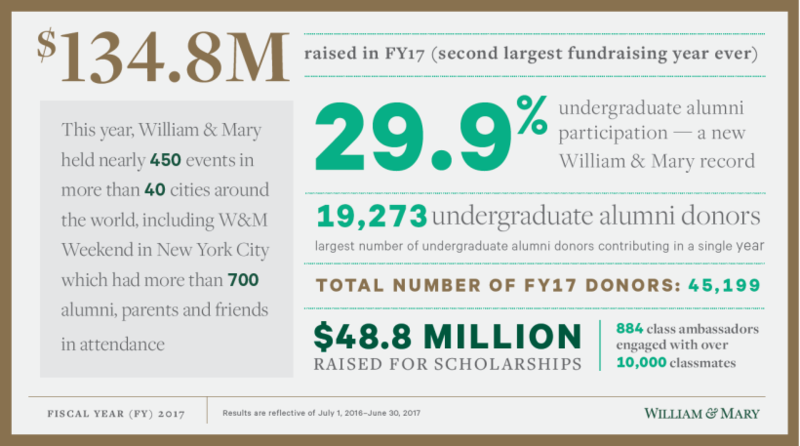 Since the start of the campaign, William & Mary has secured more than $712 million. "We're rolling," says President Taylor Reveley. "It's been especially wonderful to see the William & Mary family come together to drive For the Bold forward. Together we're providing the means for W&M to sustain its excellence - indeed, to grow its excellence - for centuries to come." Importantly, the university has nearly doubled the number of undergraduate and young alumni donors since For the Bold began in 2011. Young alumni who graduated within the last 10 years represented 26 percent of all undergraduate alumni donors in FY17. "We have doubled down on our efforts to engage with our alumni, parents and friends in new and innovative ways," says Sue Hanna Gerdelman '76, For the Bold campaign chair. "The university is very focused on increasing annual gifts of all sizes - even small yearly donations together produce significant impact. In fact, gifts under $250 collectively added up to more than $3 million in FY17. We are all very proud of the success we have seen this year and will continue to build momentum for our ambitious campaign in the year ahead."